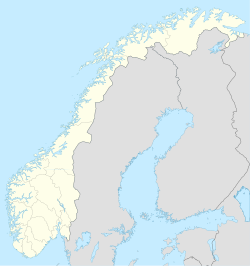 Andselv is a village in Målselv Municipality in Troms county, Norway. The village lies along the Andselva river in the urban area called Bardufoss. Andselv is located just north of Bardufoss Airport along the European route E6 highway about 2 km (1.2 mi) north of the village of Heggelia and 3.5 km (2.2 mi) south of the village of Andslimoen. The 0.67-square-kilometre (170-acre) village has a population (2017) of 1,030 which gives the village a population density of 1,537 inhabitants per square kilometre (3,980/sq mi). ^ "Andselv" (in Norwegian). yr.no. Retrieved 2012-10-08. ^ Store norske leksikon. "Andselv" (in Norwegian). Retrieved 2010-02-16. This page was last edited on 20 August 2018, at 00:06 (UTC).